I sympathize with your situation, we’ve had the same trouble before. It is very frustrating to walk out into an area designated for people to enjoy themselves only to find that the chickens thought it to be a nice, relaxing place as well. The only way you’ll keep your flock off the patio without the aid of a barrier is to use your creativity and train them to stay off. Using basic animal training techniques, you’ll have to make the flock decide that being on the porch isn’t really that fun after all. When training any animal, keep in mind their basic instincts; survival (which includes reproduction), comfort and food. In other words, you can’t reason with an animal, you have to appeal to their instincts for the training to be effective. There are two sides to training an animal, positive reinforcement and negative reinforcement. Positive reinforcement involves rewarding the animal for doing what you want them to do. This would likely involve an edible reward when they approach the patio but do not go onto it. Couple the rewards with a happy, approving voice and words of encouragement. It might also include rewarding them for making a hasty U-turn when you tell them to get off the patio. You’ll need to work with your particular circumstances to determine what is behavior that is to be rewarded. This a step by step process with the goal being to teach the chickens that good things happen when they stay off the porch. As they start to learn that it’s good to stay off the patio, give the rewards less often until eventually they no longer need the rewards. Conversely, the chickens need to be aware that bad things happen when they do go onto the porch. Negative reinforcement is about teaching the chickens that the patio is an unpleasant place to be. With 20,000+ readers, there will be a varying degree of tolerability in what are and are not acceptable techniques to break unwanted behavior. For that reason, I’ll not go into a lot of specifics. I’d encourage you to start with something mild, like a strong, loud command to get off the porch and step it up from there. Whatever you do, I must encourage you to treat the animals as living things. Positive and negative reinforcement will need to be used together for your training to be effective. You can’t correct wrong behavior without instruction and reward for good behavior. David, you’ll need to determine how important it is to you to have a chicken free patio because this will require commitment from you. It can be a slow process and will require a lot of your time. Here’s the key; they must NEVER be allowed on the patio again once you begin this process. If they are allowed, even once, back onto that patio, it is likely that all your hard work will be lost. To illustrate this point, lets use the example of gambling. A slot machine is a great example. You put in your coin, pull the lever or push the button. Chances are that when the lights stop flashing, you will have lost. But you put in another coin, and another, and another. You’ll probably win a little something here and there. The small winnings keep you playing, they encourage you to keep putting money in the machine. You keep playing in the hopes of winning the jack pot. If you put your coin into the machine and never won anything, you wouldn’t play anymore. Those small winnings keep you coming back. Each time you lose, it is negative reinforcement. Each time you win, even a little, it is positive reinforcement. If each time your chickens step a foot onto the patio they are met with negative reinforcement, they’ll stop coming onto the patio. It’s a process and not one you’ll have to keep up forever but you’ll have to stick with it until the behaviors are learned. Also, see if you can determine if they seek out the porch for shade, shelter from the wind or the like. If so, provide those things for them in an area that is acceptable. 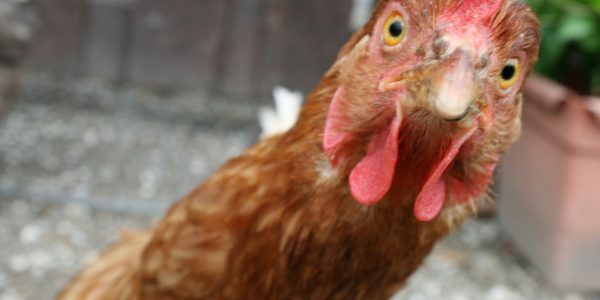 On another related note, if you take scraps or treats out to your flock, do they come running up to you in anticipation of receiving the treat? Never give them their treat in an area you don’t want them visiting regularly. Wait until you and they are in an area in which they are allowed to range. If they greet you as you step outside and you start feeding them there, they are receiving positive reinforcement for being in that area and will hang around there. Finally, I have been told of one physical barrier that can easily put up and be taken down. My aunt told me that they were having trouble with geese getting into the courtyard of a local building. They put a run of bright yellow plastic ribbon across the front of the courtyard. People could easily step over it and the geese avoided it – problem solved. Does it work for chickens? I don’t know but if anyone tries it, I’d love to hear how it worked.